American communications technology satellite. Experimental communication satellite built by Lincoln Laboratory for Lincoln Laboratory, USAF, USA. Launched 1965. AKA: Lincoln Experimental Satellite. Status: Operational 1965. First Launch: 1965-02-11. Last Launch: 1976-03-15. Number: 8 . Gross mass: 52 kg (114 lb). The LES spacecraft were designed and built by MIT's Lincoln Laboratory in Lexington, Massachusetts, as part of the an Air Force-sponsored program to test in orbit new devices and techniques for use in military satellite communication systems. 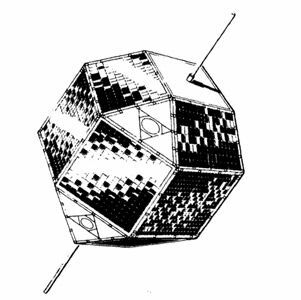 LES-5, launched July 1, 1967, was designed primarily to aid in the development of a tactical satellite communication (TACSATCOM) system for the Department of Defense. It was used for the first communications by satellite among Army, Navy, and Air Force units, including aircraft in flight, submarines and surface vessels, and a variety of ground terminals. 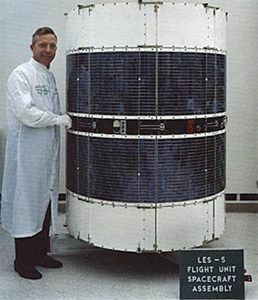 LES-5 was the first communication satellite to operate entirely in the government-allocated UHF-band (225-400 MHz), and it carried the first UHF-band satellite antenna system that generated circularly polarized radio signals to minimize fading and communication dropouts and to allow a surface terminal to use a very small, simple antenna such as a whip or stub monopole. LES-3, a UHF-band radio signal generator launched in December 1965, helped to establish design criteria for LES-5. 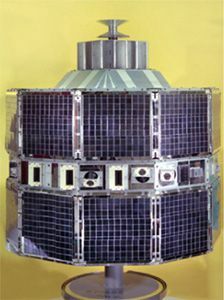 LES-1, -2, and -4, also launched in 1965, operated at X-band (approximately 8,000 MHz), and successfully tested a number of important new devices and techniques, including the first all-solid-state communication satellite transmitters and the first "electronically despun" (earth-sensing and antenna-beam-switching) system to increase the effective radiated power from the satellite. LES 1, 2 Experimental communication satellite built by Lincoln Laboratory for Lincoln Laboratory, USAF, USA. Launched 1965. LES 3 Experimental communication satellite built by Lincoln Laboratory for Lincoln Laboratory, USAF, USA. Launched 1965. LES 5 Experimental communication satellite built by Lincoln Laboratory for Lincoln Laboratory, USAF, USA. Launched 1967. LES 6 Experimental communication satellite built by Lincoln Laboratory for Lincoln Laboratory, USAF, USA. Launched 1968. 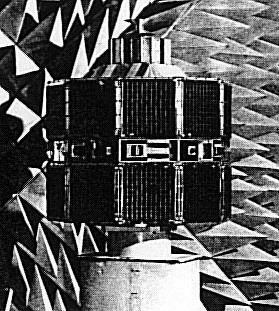 LES 8, 9 Communication, experimental satellite built by Lincoln Laboratory for Lincoln Laboratory, USAF, USA. Launched 1976. 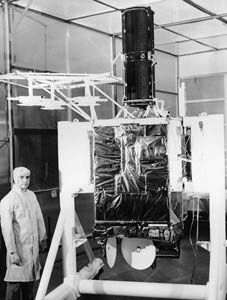 LES 7 Experimental communication satellite built by Lincoln Laboratory for Lincoln Laboratory, USAF. Family: Communications technology sat, Medium earth orbit, Technology. Country: USA. Launch Vehicles: Titan, Titan IIIC, Titan IIIA. Launch Sites: Cape Canaveral, Cape Canaveral LC20, Cape Canaveral LC40, Cape Canaveral LC41. Agency: USAF, Lincoln. Bibliography: 2, 405, 6, 11329, 12759, 12760. 1965 February 11 - . 15:19 GMT - . Launch Site: Cape Canaveral. Launch Complex: Cape Canaveral LC20. LV Family: Titan. Launch Vehicle: Titan IIIA. LES 1 - . Mass: 31 kg (68 lb). Nation: USA. Agency: USAF. Class: Technology. Type: Communications technology satellite. Spacecraft: LES. USAF Sat Cat: 1002 . COSPAR: 1965-008C. Apogee: 2,809 km (1,745 mi). Perigee: 2,783 km (1,729 mi). Inclination: 32.10 deg. Period: 145.80 min. Titan IIIA, Vehicle #3, was launched from Cape Canaveral. In a maneuverability test involving three separate orbits, the Transtage and two satellites were successfully placed into their programmed orbits. The primary objective of the mission was the triple ignition of the Transtage engine that was required for the three separate orbits. When it placed the Lincoln Experimental Satellite (LES-1) into orbit, the vehicle became the first Titan III to inject an operational payload into orbit. Lincoln Experimental Satellite; communications experiments. Space craft engaged in investigation of spaceflight techniques and technology (US Cat A). 1965 May 6 - . 15:00 GMT - . Launch Site: Cape Canaveral. Launch Complex: Cape Canaveral LC20. LV Family: Titan. Launch Vehicle: Titan IIIA. LES 2 - . Mass: 37 kg (81 lb). Nation: USA. Agency: USAF. Class: Technology. Type: Communications technology satellite. Spacecraft: LES. USAF Sat Cat: 1360 . COSPAR: 1965-034B. Apogee: 14,810 km (9,200 mi). Perigee: 2,771 km (1,721 mi). Inclination: 32.20 deg. Period: 309.90 min. The fourth Titan IIIA flight test missile (Vehicle #6) was launched from Complex 20 at Cape Canaveral in a maneuverability test for the Transtage. The primary aim was for the Transtage engine to accomplish four separate ignitions, something never before attempted. In the process of successfully completing its four programmed ignitions and burns, the Transtage placed two satellites into orbit - a Lincoln Experimental Satellite (LES-2) and a hollow aluminum radar calibration sphere (LCS-1). By completing its assigned tasks, the Transtage extended the capabilities of the Titan IIIA beyond it's specific requirements. Because of this highly productive mission, the planned fifth Titan IIIA (Vehicle 7/4) launch was cancelled and the booster was converted to a Titan IIIC configuration. Experimental commsat. Space craft engaged in investigation of spaceflight techniques and technology (US Cat A). 1965 December 21 - . 14:00 GMT - . Launch Site: Cape Canaveral. Launch Complex: Cape Canaveral LC41. LV Family: Titan. Launch Vehicle: Titan IIIC. LES 4 - . Mass: 52 kg (114 lb). Nation: USA. Agency: USAF. Class: Technology. Type: Communications technology satellite. Spacecraft: LES. Decay Date: 1977-08-01 . USAF Sat Cat: 1870 . COSPAR: 1965-108B. Apogee: 33,632 km (20,897 mi). Perigee: 189 km (117 mi). Inclination: 26.60 deg. Period: 589.20 min. Lincoln Experimental Satellite; experimental commsat; transmitted in X-band. Space craft engaged in investigation of spaceflight techniques and technology (US Cat A). .
LES 3 - . Mass: 16 kg (35 lb). Nation: USA. Agency: USAF. Class: Technology. Type: Communications technology satellite. Spacecraft: LES. Decay Date: 1968-04-06 . USAF Sat Cat: 1941 . 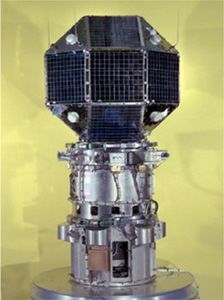 COSPAR: 1965-108D. Apogee: 4,829 km (3,000 mi). Perigee: 267 km (165 mi). Inclination: 26.50 deg. Period: 139.90 min. Radio signal source for commsat tests. Space craft engaged in investigation of spaceflight techniques and technology (US Cat A). .
1967 July 1 - . 13:15 GMT - . Launch Site: Cape Canaveral. Launch Complex: Cape Canaveral LC41. LV Family: Titan. Launch Vehicle: Titan IIIC. LES 5 - . Mass: 194 kg (427 lb). Nation: USA. Agency: USAF. Class: Technology. Type: Communications technology satellite. Spacecraft: LES. USAF Sat Cat: 2866 . COSPAR: 1967-066E. Apogee: 33,609 km (20,883 mi). Perigee: 33,196 km (20,626 mi). Inclination: 12.00 deg. Period: 1,316.00 min. Experimental commsat. Space craft engaged in investigation of spaceflight techniques and technology (US Cat A). .
1967 July 4 - . The first tactical communications by satellite between the US Air Force, Army, and Navy - . Spacecraft: LES. The first tactical communications by satellite between the Air Force, Army, and Navy was accomplished via LES-5 on 3 and 4 July..
1968 September 26 - . 07:37 GMT - . Launch Site: Cape Canaveral. Launch Complex: Cape Canaveral LC41. LV Family: Titan. Launch Vehicle: Titan IIIC. LES 6 - . Mass: 163 kg (359 lb). Nation: USA. Agency: USAF. Class: Technology. Type: Communications technology satellite. Spacecraft: LES. Completed Operations Date: 1976-01-01 . USAF Sat Cat: 3431 . COSPAR: 1968-081D. Apogee: 35,839 km (22,269 mi). Perigee: 35,776 km (22,230 mi). Inclination: 12.80 deg. Period: 1,437.20 min. A Titan ITIC space booster (Vehicle #5) was launched from Complex 41 at the Eastern Test Range and inserted four satellites into separate earth orbits. 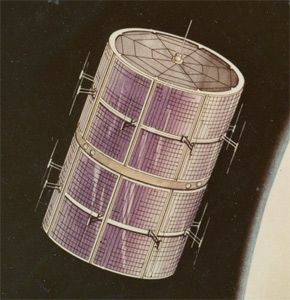 The primary payload was the Lincoln Experimental Satellite (LES-6) which was the second all-solid-state ultrahigh frequency (UHF) band communication satellite to be placed into a synchronous orbit. It was designed to test communications with aircraft, ships, and ground forces. The other three satellites were Office of Aerospace Research (OAR) payloads - two Experimental Research Satellites (ERS-21 and ERS-28) and an Orbiting Vehicle (OV 2-5) research satellite. Experimental commsat. Space craft engaged in investigation of spaceflight techniques and technology (US Cat A). Positioned in geosynchronous orbit over the Atlantic Ocean at 38 deg W in 1968-1975 As of 26 August 2001 located at 61.90 deg W drifting at 0.101 deg E per day. As of 2007 Mar 9 located at 73.59W drifting at 0.201E degrees per day.